Cacao helps the body process nitric oxide, a compound for healthy blood flow and blood pressure. It contains antibacterial agents that fight tooth decay. 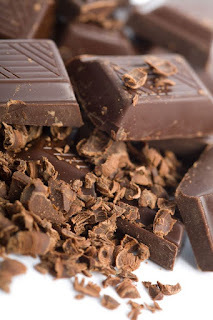 The polyphenol content of cocoa solids exceeds that of all common foods, including tea, berries, or grapes. Polyphenols such as Catechins and procyanidins, appear to support artery function and promote healthy blood fat and clotting profiles. The stearic acid from cocoa butter contained in many healthy chocolate bars, has no known adverse effects on blood cholesterol profiles. Cocoa butter also contains oleic acid, a mono-unsaturated fat that raises good cholesterol. Chocolate also contains phenylethylamine (a mild mood elevator) and flavanoids that keep blood vessels elastic. Cocoa is natural a source of minerals like copper, it’s an antioxidant as potent as green tea, and protects against heart disease and helps relieve stress. Chocolate is a $60 billion global industry today. The average American consumes 12 pounds of chocolate per year. (58 million pounds are sold around Valentine's Day alone.) And the Swiss, Austrians, Germans, Irish, British, Norwegians, Danes, Belgians, Swedes and Australians all eat more than we do. Mesoamericans first cultivated cacao beans more than three thousand years ago. The Mayans made it into a sacred drink, offered it in tribute to kings, and placed it in the tombs of the nobility so they could savor it in the afterlife. By the time Columbus arrived, cacao beans were traded as a commodity. Today the world produces over three million tons of cacao beans a year. But the cocoa crop requires a long rainy season and deep rich soil within twenty degrees of the equator. It requires high humidity, constant pruning, and protection against pests so do your best to buy organic. Vital Choice offers a delicious, dark organic chocolate with 80% cocoa yet you would never know it as it is far from bitter. Chocolate is often the final touch of elegance at the end of a good meal - or a special treat to be savored. Ever been to a hotel and enjoyed their “turn down service?” If you’re finding it difficult to fold back the covers on your bed, perhaps you shouldn’t be traveling without your nanny but really, most people request this “service” for the little chocolates they place on your pillow. Premium chocolate is only slightly less nuanced than fine wine. It's recognized by its aroma, strength, and balance of taste sensations and interesting textures. It is a reminder to slow down, look, smell, taste, and take your time. But some of the more “pedestrian” chocolates can be every bit as good. Life would NOT be the same without my M&M’s, for example. Chocolate is something we all associate with our childhood and with happiness. It provides a feeling of well-being. It has clear health benefits. It doesn't just taste good. It helps you live longer (trust me, it’s the ultimate de-stressor.) No wonder women find it only slightly less vital than oxygen.